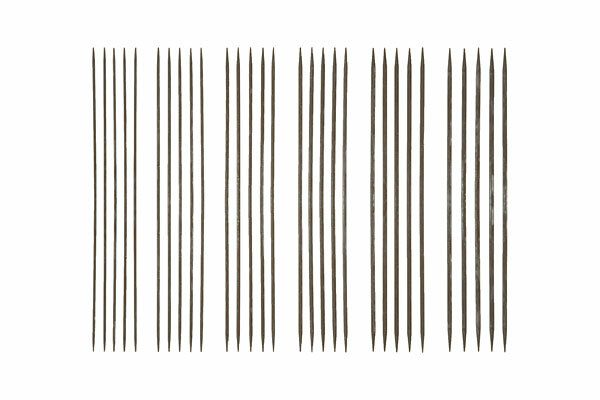 This collection of 6" nickel-plated double pointed needles is the perfect gift for the avid sock knitter. We have assembled the most common sock knitting sizes and packaged them in this portable, flexible, 6" by 6.5" vinyl case with snap shut closure. Each size is neatly labeled on the enclosed packaging so you can see the sizes at a quick glance. Watch the metric sizes - they are more finely tuned than the US sizes. Set of 5 per needle size. All of these sizes are also available separately. I am very pleased with my dp nickle plated needles! The weight in my hand is quite comfortable. They are very smooth and I like that my stitches slide so easily. I also like that they are American made and a reasonable price. I really like these Needles, they are great to knit on But... In my opinion, not having the size etched on them is a down fall. I am a very fast & furious knitter who absolutely destroys most needles. I consider wooden & bamboo to be disposable, one-project tools. 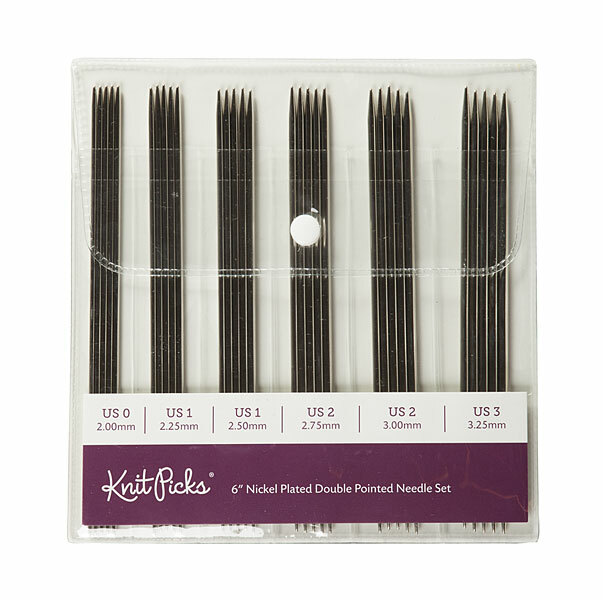 I have been looking for affordable, smooth, pointy, extremely durable needles most of my life and these are as good as it gets. I just ordered my second set of 6" sock needles because I have worn the finish off several of the first set. They lasted better than most, and I love the slick feel of them. The price is excellent for the quality of needles. I have paid much more for needles that didn't last half as long. I definitely recommend chrome plated needles for anyone who likes to knit fast. Knit Picks quality just isn't what it used to be. I have always been an big supporter of Knit Picks because they made knitting affordable, but the last few things I have ordered havr been poor quality. When I pulled out these needles, I instantly noticed the difference in the nickel plating compared to my interchangeables. They are much stickier. The ends are also much to blunt. Had I known this, I would have purchased another set. I hope KP gets their act together, otherwise I don't think I will be purchasing from them again.